RHA’s MA750 features a stainless-steel construction which boasts a high level of sturdiness. Apart from that, the sheer design of these headphones is quite unique and sufficiently appealing so as to be labeled as “beautiful”. The 560.1 driver is the “core” of MA750’s hardware, delivering high-quality sound at all times. Furthermore, the ear hooks are flexible and quite comfortable. Basically, this headphone set is all about simplicity, which is one of its greatest benefits. 1More Triple driver features, well three drivers, which is the reason why they named it like that. They feature a beautiful, subtle design with aluminum-color buds that really stand out from the rest of the bunch. These headphones promise a comfortable fit – they’re designed for people who’re accustomed to low-profile buds, as they’re neither flush or angled. What’s more, 1More Triple Driver headphones come with a long, sturdy cable which, sadly, tends to get tangy at times, but it’s durable enough for a $100 headphone set. One of the most notable flaws of 1More triple driver is the remote controller which features plastic materials – even though it’s easy to use it, it’s cheap and flimsy at best. The foam tips are the ones you’ll see straight out of the box, but you’ll get a set of several pairs of silicone ear tips which you can use to compensate for the mediocre comfortability of the factory tips. 1More triple driver wins this round without a contest – the soundstage of their headphones is simply phenomenal, as you’ll be able to hear virtually every single sound with accuracy and clarity. Of course, certain songs (for example, heavier tracks like metal or hard rock) might appear muddy at times, but only in fragments – the instrumental parts are always clear and audible. On the other hand, RHA MA750 isn’t bad in terms of sound quality – it’s just that you’ll notice the lack of detail in songs when you compare its performance to that of 1More triple driver headphones. All things considered, both of these headphone sets are quite great in the field of performance, but this one goes to 1More triple driver headphones. 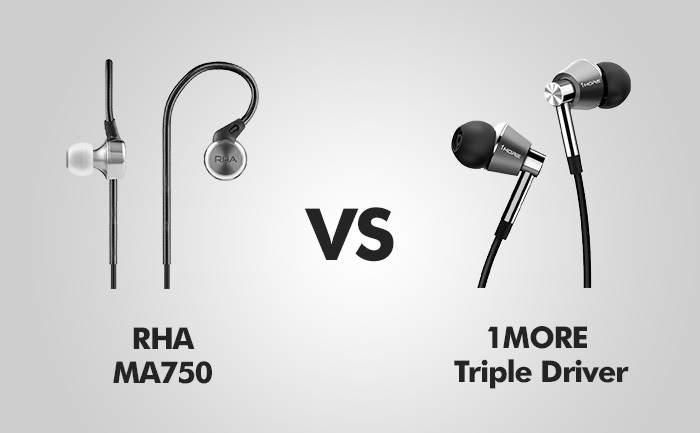 Oddly enough, RHA’s MA750 headphones cost more than 1More triple driver set – the reason why this is strange is that the latter boats a higher value and overall quality. Needless to say, the MA750 brings quite a few innovations and benefits with its design, but it’s safe to say that its value is inferior to that of 1More triple driver headphones. That being said, this round goes to 1More triple driver headphones. Comparing the comfort levels of RHA’s MA750 and 1More’s triple driver headphone set is not an easy task. They’re both very comfortable to wear, although MA750 tends to be lighter on the wearer’s ears due to specifically designed eartip style. You’ll have to replace your factory earbuds (made of silicone) with your 1More triple driver headphones in order to get a level of comfortability which will only then be comparable to comfort rating of RHA’s MA750. PROS: Plain, straightforward design / Decently valuable for the cash / High versatility and customization / Superb noise isolation. PROS: Great aesthetics / Superb value for the money / Remarkable soundstage / Versatile budget headphones / Decently affordable. CONS: Muddled sound at times / Potential issues with connection. CONS: The cable is a bit too long / Cheap remote controller. It’s safe to say that RHA’s MA750 headphone set is awesome in its own right, but it simply pales in comparison to 1More triple driver headphones. 1More have really outdone themselves with this model, and it’s easy to see where all the hype is coming from – these headphones boast an unmatched level of sound quality, they’re unparalleled in terms of performance, and they don’t cost a fortune. That’s quite enough to declare them a victor in this contest.